How This Washer & Dryer Can Help You Save Money On Your Utility Bill! Posted on October 23, 2017 by Heather W.
We are a family of five and as you can imagine… I do A LOT of laundry. No matter how well I keep on on the laundry, a pile of dirty clothes quickly accumulates in the laundry room in a matter of no time. I have owned several washer and dryer sets over the years and there is undoubtedly a difference in my bill depending on which brand I go with. Some promise to offer a better and more more convenient way to clean your laundry… but at what cost? When searching for a washer and dryer set, I always tell friends and family to go with a pair that is energy efficient as well! One place that I often find myself when shopping for appliances is Best Buy! This is defiantly not the first place that pops up in people’s head when they think appliances… but trust me, this place does more than sell electronics and TVs. They are committed to positively impacting the environment and its communities and provides their customers with a wide assortment of sustainable products. This includes offering a large selection of energy-efficient products, including ENERGY STAR certified electronics and appliances! Make your laundry experience better with ENERGY STAR! Not only is this brand better for your clothes, but it is also better for you and your family AND better for the environment! This brand of washers and dryers saves energy, which means that you are going to save on your energy bills. 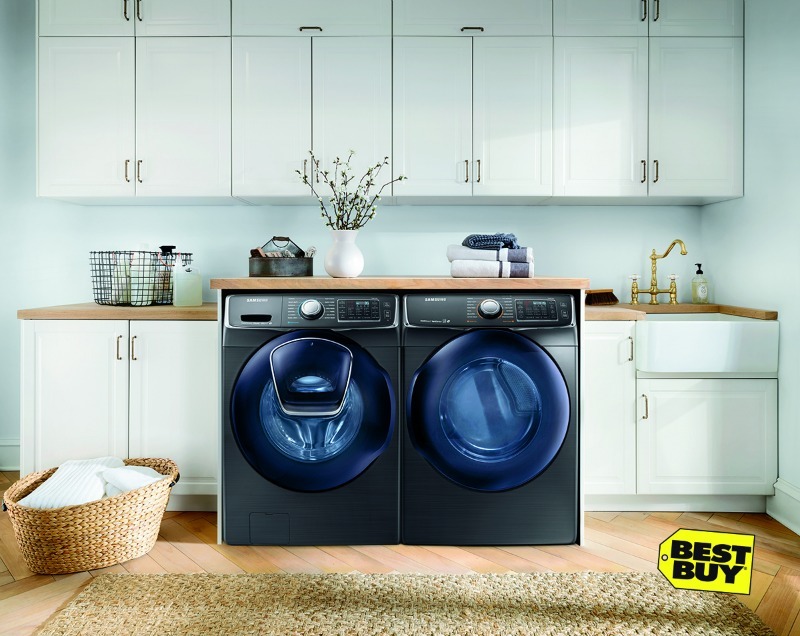 You are going to save $490 over the lifetime of an ENERGY STAR certified clothes washer and even more with an ENERGY STAR washer/dryer pair. Many of these washer and dryers are also equipped with advanced features that make cleaning and drying easier and more effective so you can spend less time doing laundry and more time with family. There is no sacrificing when it comes to these washer and dryers! ENERGY STAR clothes washers use a variety of sophisticated cleaning methods that are gentler on your clothes, while ENERGY STAR clothes dryers use less heat and sensor drying which reduces wear and tear on clothes from over drying. Many ENERGY STAR dryers also include convenient features, such as a steam cycle that can help save time on ironing clothes by preventing wrinkles. So what are you waiting for? Stop using that energy sucking washer and dryer that takes hours longer than it should to get the clothes cleaned and dried. Make the switch to a ENERGY STAR washer and dryer and start saving time and money!